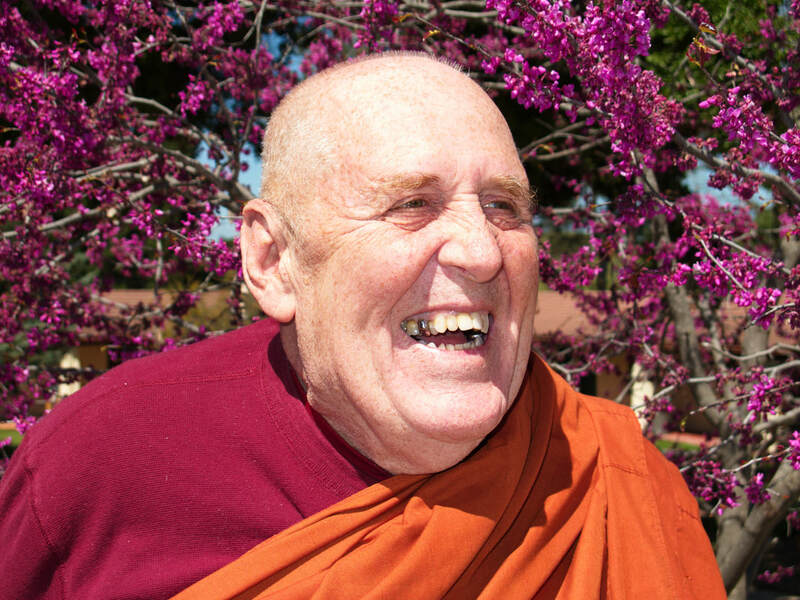 Bhante Vimalaramsi has practiced meditation for more than 40 years and is a well known Meditation teacher and author. He is interested in practicing meditation by going back to the earliest Buddhist Suttas to find out what the Buddha really taught. He uses the Majjhima Nikaya as his basis for teaching the "Mindfulness of Metta" and the Brahmaviharas, that lead to the realization of Nibbana. He calls this Tranquil Wisdom Insight Meditation (T.W.I.M.). Wiki Entry here. Bhante Vimalaramsi is an American monk who was ordained in Northern Thailand in 1986 at the age of 40. He left the USA to seek awakening through meditation in the early 80's and decided to let go of all of his material possessions. Before this starting in 1974 he engaged in Vipassana courses in California and even lived and worked at a meditation center in San Jose, California to 1977. Bhante Vimalaramsi has studied with many famous teachers in Asia. Among them are Venerable U Pandita, U Lakkhana, U Silananda, U Janaka, U Dhammananda, U Dhammapia and he met Mahasi Sayadaw. He further studied with The Mingun Sayadaw, who had memorized the entire Tripitaka and Sayadaw U Thatilla. Other teachers he spent longer periods of time with were the late Most Ven K Sri Dhammananda, Venerable Punnaji, Ajahn Yanitra, Ajahn Buddhadasa, Ajahn Cha Lee, and Ajahn Santititho. Bhante practiced Vipassana very intensely his first 20 years under an American teacher and in Burma, under U Pandita and U Janaka. Finally around 1990 he was told that he had achieved the endpoint of the practice, as it was taught by the Sayadaws, and now he should go teach. He didn't feel comfortable that he had really found the end of suffering. He felt he did not have the true personality change that awakening should bring, even after going through the 16 levels of Insight or knowledges, as outlined by Mahasi Sayadaw in Progress of Insight. From 1991 to 2000 he dedicated himself to "direct experience through study of the suttas and meditation practice". At first he stayed with K. Sri Dhammananda in Malaysia and taught Metta meditation. Then he had a real change in direction with his meeting of a Sri Lankan senior monk, Bhante Punnaji, also in Malaysia. His advice was to ‘study the suttas directly and to let go of relying on commentaries like the Visuddhi Magga'. Specifically he said, ‘Read only the suttas, then practice'. This was very significant because the commentaries were influencing how he was seeing the entirety of the Dhamma, at the time. It was suggested to put them aside while he studied the suttas as a standalone system. Nanavira in the early sixties, suggested this and then Stephen Batchelor also talked about just using only the suttas in his book "A Buddhist Atheist". When Bhante began to do this, he discovered first hand, the interwoven nature of the Teachings. In each sutta he found the elements of the 4 Noble Truths, the 8-Fold Path, and the impersonal process of Dependent Origination. Dependent Origination or Paticcasamupada is the core of the Buddha's teachings. He realized that the word sutta literally meant "thread" and that the threads together, created a finely woven cloth, whereas, one single thread does not equal a cloth! Through his own objective first hand experience, the 8-Fold Path began to come alive. When he realized the secret of the teachings was on his doorstep he took the Majjhima Nikaya to a cave in Thailand and spent 3 months, living with a cobra as company, reading and then practicing just what the suttas said. In very little time, he said, he had gone deeper in his meditation, than ever before. What started as two weeks to study suttas turned into three months of deep practice. Out of this was born TWIM or Tranquil Wisdom Insight Meditation completely based on the suttas in the Majjhima Nikaya. He found the Jhanas had an entirely different explanation and experience. Nibbana was possible! In 2002 a parcel of land was given to him, a short distance from the current center. Subsequently that land was taken back by the owner, for personal reasons, but another piece was identified by that owner with a house and 30 acres of land about 10 miles away, near the Taum Sauk Reservoir area. He moved there and in 2003 founded the United International Buddha Dhamma Society [UIBDS] and created Dhamma Sukha Meditation Center and Monastery (DSMC) in 2004, He currently resides and teaches there in Missouri, south of St. Louis. He conducts retreats and gives talks in Asia and Europe during the colder winter months. Bhante has held retreats in Malaysia, Germany, Indonesia, South Korea, Sri Lanka and many locations throughout the United States. Many of the talks are recorded, and are on Youtube and our website in the Dhamma Talks library. Translations are also available in many different languages. MN 36 "The Greater Discourse to Saccaka"
MN 148 "The 6 sets of 6"